In addition to being safe for humans, pets and plants, some benefits of organic flea treatments include the fact that insects cannot build up an immunity in the way that they have to past chemical pesticides. The Flea Shredder product uses a non-toxic and environmentally friendly method to completely eliminate fleas indoors or outdoors. A new report from Planet Amazing says that organic flea treatments have many benefits that make them better than past chemical pesticides. Prior to 1995, the report says, most flea treatments used various poison chemicals to fight flea infestations, and to kill fleas. These chemicals had some serious problems because they were toxic to children, pets and plants. There was also a phenomenon called "resistance" that developed in insects where the fleas could withstand the poisons after many generations. "Resistance" means, according to scientific studies, that the insects can survive now after being treated with the same chemicals that - 20 years ago - would have killed them. Justin Douglas of Planet Amazing says that the problems with fleas have gotten worse in some ways because of the phenomenon of "resistance." "These insects have started surviving when the exterminator comes out, because fleas in general have developed a resistance to chemicals that have been used for the last 50+ years," he says. Organic flea treatments and non-toxic solutions solve those problems, says Douglas. "Our Flea Shredder product uses a non-toxic and environmentally friendly method to completely eliminate fleas indoors or outdoors, and Flea Shredder from Planet Amazing is not harmful to children, pets or plants," he says. "In fact, one of the great discoveries in organic flea treatments has been the use of microcrystals, which are so small they have no effect on people, pets or plants, but which are fatal to insects and have no chemical in them at all. So microcrystals can be sprinkled like a powder on plants and indoors, in the garden, in carpet, and they will eliminate bedbugs, fleas, ants, roaches, and most other crawling insects." According to Mr. Douglas, "Our microcrystal ingredient is one part of the process for most of our environmentally safe pesticide solutions. It is literally on the cutting edge of the pest control industry, because the microcrystals cut up the tiny insects and yet the microcrystals are completely safe for humans and pets, since the crystals are so extremely small. In fact, the substance is usually in powder form and can be sprinkled on carpet or any surface or even the outside ground. Then the microcrystals stick to the insects skin, and force the wax coating of the insect to become cut away from the body of the insect, thus killing the insect." Mr. Douglas says the insects often find their way back to their eggs and the microcrystals then cut up the larvae and eggs, rendering them unable to grow. He says that no chemicals are used in the process, and that it is highly effective: "These micro crystals attach to the legs and bodies of bugs. When they groom it off, the crystals are like ground glass in the bugs intestines, shredding them from the inside out. Because of the microscopic size of the crystals, carpet dust is harmless to your family and pets." 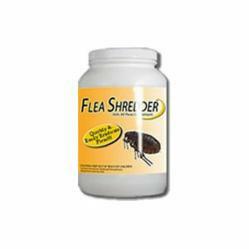 For more information, visit the Amazon.com Flea Shredder Flea Treatment store. Planet Amazing, the makers of Flea Shredder™, is an EPA registered manufacturer and packager of family-friendly and environmentally safe pesticides and other products. Planet Amazing sets high standards for their operating companies in the area of environmental responsibility — striving for performance that does not merely comply with regulations but reduces the environmental impact. They commit to take care of our planet and preserve its beauty, resources and strength for future generations. Planet Amazing embraces research and science - bringing innovative ideas, products and services to advance the lives and well-being of people. Employees of the Planet Amazing Family of Companies work with its partners in order to touch the lives of people every day, throughout the world.